Roosevelt High School student Kevin Kwan reads aloud from Shakespeare's "King Lear" in English class. Worried that too many of Roosevelt High School's students were "slipping through the cracks" academically, Principal Dennis Hokama decided he needed to make a big change. Beginning this fall, each of Roosevelt's four grade levels will be carved up into self-contained "small learning communities." Part of a federal grant in which 13 other Hawaii high schools are participating, the goal is to create a more intimate setting for students to combat the anonymity and alienation often blamed for the poor performance of U.S. high schools. With increasing federal pressure on schools to perform, Hokama decided that past measures to raise reading and math skills could only take the school so far, and more drastic steps were needed. "Our gains had pretty much plateaued , and we realized that unless something more dramatic took place, we couldn't expect to keep moving forward long-term," he said. Some higher-achieving students and their parents are taking exception to a key condition of the Small Learning Communities grant: that schools not put students on separate tracks based on their ability. At Roosevelt, for example, academically gifted ninth- and 10th-graders will sit alongside their lower-achieving classmates for English, social studies and science, without the option of separate honors-level classes for those subjects. The belief is that such "heterogeneous" groupings will lift up those on the lower end -- the key objective of the federal No Child Left Behind Act -- but there is concern at Roosevelt and other participating schools that the academically gifted will suffer. Inga Park Okuna, whose eighth-grade son Keith is set to advance from Kawananakoa Middle School to Roosevelt in the fall, said her now-adult daughter had a "terrible" past experience with heterogeneous groups. "It's really risky with gifted students. Since everything comes so easily for them, they get lazy and lose interest if they're not challenged," she said. "But the class will inevitably move at the pace of the slowest students." Park Okuna, a counselor and teacher for deaf students in the DOE who graduated from Roosevelt herself and passionately supports public schools, is now contemplating the previously unthinkable: applying for Keith's admission to private school. "I never thought we'd even consider that, but this has made us really nervous," she said. 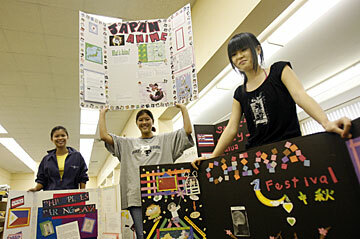 Kaimuki High School students Ana Natividad, left, Ariana Masuoka and Chang Qiuchen show projects demonstrating ethnic pride. The SLC concept has been around for years, but is gaining traction across the country as No Child Left Behind has highlighted the need for greater intervention to boost American schools, especially high schools. Bill Gates has made SLCs his pet project, offering $1 billion in his own grant money. Few dispute the benefits for low achievers: A less intimidating school environment is thought to keep students engaged; greater cooperation between teachers of different subjects within an SLC allows them to integrate lessons and intervene to help struggling students. Proponents point to research showing SLCs lead to greater attendance and reduced school violence. Some results are already being seen in Hawaii. Several high schools that are further along than Roosevelt saw their retention rate -- the percentage of students held back a year -- drop between 2 and 4.5 percentage points in 2004-05, said Aileen Ah Yat, the grant's statewide coordinator. Hokama said that Roosevelt's teachers will push more advanced students to do more, while providing more support to those who are struggling. The ultimate goal is to lift the level of all students in the ninth and 10th grades so that eventually more will be able to take Advanced Placement courses, which will still be offered to upperclassmen. Currently, out of 280 honors-level students at Roosevelt, only one is of native Hawaiian ancestry, and "that's not acceptable," Hokama said. "Some parents are concerned that their student will get less. But this gives us the best chance to do the most we can for the most kids," he said. But some say it worsens a trend in which the needs of gifted and talented kids are increasingly ignored as schools focus attention and resources on low achievers to avoid No Child Left Behind's sanctions. Past court orders have caused spending on special-education students to balloon to over $300 million a year, compared with just $4.7 million for a roughly equal number of students -- over 17,000 -- in the DOE's gifted and talented program. Meanwhile, a new system of dividing overall school funding will be introduced in the fall, cutting the budgets of even some of the poorest-performing schools, raising fears that the gifted will get even less attention. "(Schools) are absolutely trying to bring up the bottom by sacrificing the top," said Janet Shores, president of the Hawaii Gifted Association, which advocates for gifted students. Kalani High School, one of the first to implement SLCs more than a year ago, offers students the opportunity to take additional honors-level courses outside of the SLC. But students must do so on their own time. Sophomore Bryan Lum said his extracurricular activities left no time for those courses, so he didn't sign up, upsetting his plans to amass credits in rigorous courses so that he can dazzle college admissions officers two years from now. Moreover, the rigor within his SLC is no better than what he experienced in middle school, he says. "I'm going to be dying in my AP English class next year," he said. Shores says that gifted students are being used in SLCs as "tutors" for their struggling peers,* something that SLC proponents don't dispute. "The highest level of learning is when a student has the ability to instruct others," said Principal Dennis Manalili of Kaimuki High School, which also is part of the grant. Much of the grant money -- which ranges from around $300,000 to $800,000 per school -- will go toward training teachers in the difficult art of shifting gears between students to provide a level of rigor appropriate to each one's abilities. There is general agreement that SLC success depends on that. "It can be a disaster if you don't achieve that," said Gary Griffiths, project coordinator with the Office of School Redesign in the University of Hawaii's College of Education. "But if done right, all of the research and the experiences of many mainland schools show that this can be wildly successful," he said. That's not how Kalani High senior Henry Cheng would describe the SLCs at his school. Cheng, who spearheaded a drive to bring student concerns to the school's attention, credits Kalani with being "responsive" to student concerns. But he feels teachers have been unable to juggle the classroom challenge of heterogeneity, "greatly affecting" gifted students. "SLCs can make or break a school. Unfortunately, it's breaking ours," he said. What: A federal grant to plan, implement or expand "smaller learning communities" in large high schools. Why: Aimed at boosting student achievement by providing a more intimate learning environment. Based on research showing that smaller schools are safer and more productive because students feel less alienated and because teachers have more time to connect with individual students. How: Typically, each grade level is broken up into smaller groups of students that stay together for several class periods or subjects. Each group must contain a mixture of students at different levels of ability. Who: Fourteen isle high schools are in various stages of implementing the grant, with awards ranging between $300,000 and $800,000. They are: Aiea, Campbell, Kahuku, Kaimuki, Kalaheo, Kalani, Kauai, King Kekaulike, Lahainaluna, Maui, Roosevelt, Waiakea, Waianae, Waipahu. » In a Page A1 story on Sunday, Janet Shores of the Hawaii Gifted Association was quoted as saying that academically gifted students were being used to "tutor" their less gifted peers in some public schools that have set up Smaller Learning Communities, and were thereby being "sacrificed" for the benefit of lower-achievers. Shores was expressing concern that this could happen but has no firsthand knowledge of it occurring now.